As weather cools, should you take steps to protect tomatoes on the vine or should you pick them? The question applies not just as fall approaches, but even during a cold snap or when the temperature is forecast to dip overnight. One fact is certain: tomatoes do NOT like to be cold. But tomato plants can survive a cold snap or even a series of cool nights. When the soil temperatures surpass 60ºF during the day, then tomato roots will retain much of that heat even during an evening cool-down, especially when plants are mulched. However, tomato plant survival and tomato plant growth are two different matters. Whether or not tomatoes thrive through cold depends not just on temperatures, but also on the length of exposure to cold, wind, and conditions. But if you’re eager to continue to harvest fresh tomatoes well into autumn, you can do so. Use these simple steps. Keep in mind that your tomato garden is in its own micro-climate. Your local forecast will differ from what takes place in your backyard or on your patio. Set a thermometer at plant level to monitor air temperatures that will directly impact your tomato plants. 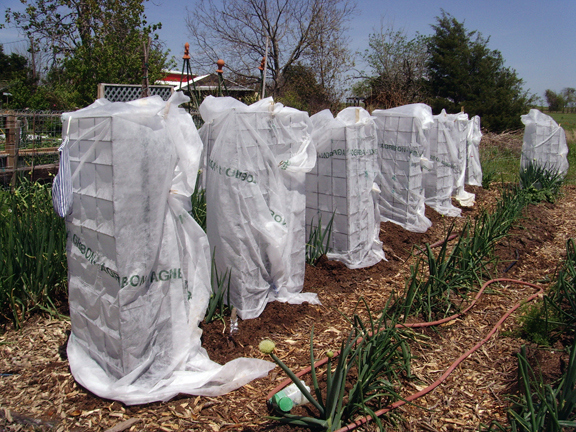 When frost or temperatures are in the forecast for overnight (mid-30s or even 40ºF), cover your tomato plants with clear plastic or a tarp. If you face an extended cold pattern, consider using quality frost protection regularly. Set up a work light – or even a string of Christmas lights – underneath the tarp or plastic to get plants a bit of extra heat. Well-hydrated plants tend to tolerate cooler or near-freezing temperatures better than dry ones. Deeply water tomato plants when cold nights are in the forecast. Temperatures between 38ºF and 55ºF won't kill tomato plants, but keeping them covered for an extended amount of time can. Remove coverings in the morning or once temperatures rise over 50ºF to give them extra light and warmth. Protecting tomato plants from the cold begins well before the calendar turns over to the fall. If you live in a northern area, have a short growing season, or are growing a second crop in one season, then consider choosing early tomato varieties or varieties that tolerate cold. Blossom drop. If your tomato plants are still producing flowers, be especially careful to protect them when cool nights (consistently below 55ºF) are in the forecast. Cold temperatures contribute to tomato blossom drop – what happens when a healthy tomato plant flowers, but no fruit develops as a result of plant stress or poor pollination. Dropped fruit. When temperatures are forecast to dip below 50ºF, make extra efforts to protect tomatoes on the vine. Fruit tends to drop off the plant when temperatures drop, too.